Samsung's wearable portfolio isn't what you'd call sparse, but there's a rumour circulating about the South Korean company's latest device that could annoy some early adopters. According to a post on Sam Mobile, the UK launch of the Samsung Gear S smartwatch is being pushed back to the middle of November. There doesn't appear to be any kind of reason but, short of a Fitbit Force-type skin irritation issue, we don't think there's much to worry about. Most likely is that Samsung is struggling to produce enough units to be shipped over to the UK. Pre-orders for the smartwatch went live over a month ago, but buyers may have to hold out a little while longer. 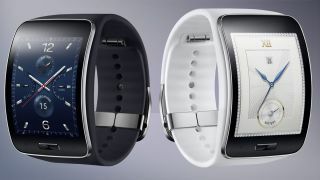 What marks the Samsung Gear S apart is that it comes with its own SIM slot and also has GPS built in. It's essentially a phone on your wrist and won't need to be attached to a smartphone for connectivity. There's a 2-inch AMOLED display, Samsung's homegrown TizenOS and plenty of watch faces to choose from. When the Samsung Gear S does land, it'll be with a hefty £340 price tag. We've contacted Samsung and will update this story when we receive a response. Read our hands on Samsung Gear S review here.